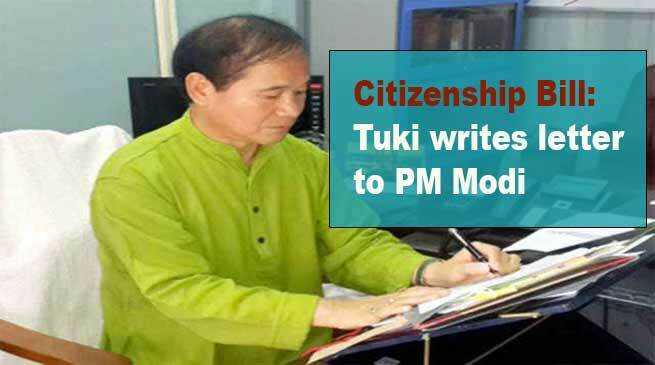 Former Chief Minister and senior Congress leader of Arunachal Pradesh Nabam Tuki has written a latter to Prime Minister Narendra Modi, former Prime Minister Manmohan Singh and Arunachal Pradesh Chief Minister Pema Khandu on Citizenship (Amendment) Bill-2016 which have made the people of North East to protest. The letter addressed to PM Modi on Monday last of which was made available to this correspondent, said that ‘The passing of the Citizenship Amendment Bill 2019 in Lok Sabha and after this the protest against the bill started in the North Eastern States are a matter of serious concern. That the hurry in which the bill is passed in the Parliament in the wake of the ensuing Parliament Elections neglecting the rights, privileges and sentiments of the indigenous people of North East is something which was avoidable at this time. The Union Government would have been more sensitive to the people of North Eastern States due to their separate origin, identity, nature, culture and demography’. The letter said ‘The Union Government who is supposed to preserve, protect and safeguard the uniqueness and characteristics of the protected Tribes of Arunachal Pradesh and other states cannot be subject to unrest and intimidation due to the largesse’s of the Government without understanding the consequences and Social, Cultural and Demographic imbalances which will be detrimental to the existence of the Region Itself’. ‘Arunachal Pradesh has already faced the unfortunate issue of settlement of chakma-Hajong refugees which has created large scale dissatisfaction and cultural problems in the state’. Tuki appeal to reconsider the decision for the greater interest of the indigenous citizens of the country, particularly North Eastern states. A separate letter has been sent to former Prime Minister Manmohan Singh on Tuesday which have created disruption and total protest in the entire NE region , several chief minister and senior political party leaders and alliance partners of BJP under NEDA (North East Democratic Alliance) has also opposed the Bill in the recent meeting held on January 28 at Guwahati. Tuki appeal the former PM to make stand clear and raise the issue and make ensure that the Bill is defeated in Rajya Sabha in order to protect the rights and privilege of indigenous people of North East India, the letter said. However in an another letter written to Chief Minister Pema Khandu on January 23 stated that if the CAB-2016 is passed in Rajya Sabha will become law of the country and thousands and lakhs of foreign refugees staying in state will claim their right which is a gross determental to the indigenous tribes of the state and the region. Tuki further requested Khandu to take a strong decision to protest before the union government for immediate withdrawal of the proposed bill and urge the union government for exemption from said (CAB) Act to the state of Arunachal Pradesh. The letter added.